AVAILABLE WITH VARIOUS LOGO COLOURS. 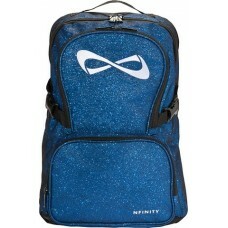 The Nfinity® Sparkle Backpack is the perfect bag to get you from school to the gym in style. Designed to hold all of your gear with four roomy compartments. Includes a padded sleeve for a laptop, mesh padded shoulder straps and back to give you total comfort and support, and of course our exciting sparkle styling.